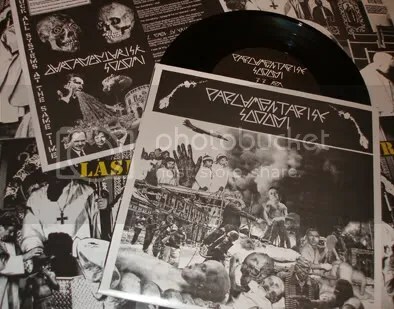 This 7″ EP includes three exclusive outtakes from the first Parlamentarisk Sodomi full lenght. On the flipside, Laserguys provide you with dark and evil sounding high-speed grindcore from beautiful Hommelvik, Norway. This release is available on black, white and red vinyl. Please email your order with your address to parlamentarisk [at] hotmail [dot] com. This entry was posted in Uncategorized and tagged Parlamentarisk Sodomi, record. Bookmark the permalink.